A treadmill is great for running or walking when the weather outside is not ideal, and they seem simple enough to use, right? Just push a few buttons and start moving. Using a treadmill seems like a piece of cake, but you might be making some mistakes that can ultimately hinder your progress and possibly even lead to injury. A treadmill is great for running or walking when the weather outside is not ideal, and they seem simple enough to use, right? Just push a few buttons and start moving. Using a treadmill seems like a piece of cake, but you might be making some mistakes that can ultimately hinder your progress and possibly even lead to injury. That said, here are five common mistakes that many people make on the treadmill and how to avoid them! I always used to skip my warm-up when I started my treadmill workouts. Who has time for that? But, I soon realized nixing this important part of my workout wasn't doing me any favors. When my body wasn't fully prepared to exercise, I often struggled to keep up with the pace I planned for myself. I'd get discouraged, so I'd slow down or quit my workout all together. I learned that only when I eased myself into the workout was I able to really challenge myself and get a more effective workout. And, of course, a proper warm-up can help prevent pain and injuries, too! I used to be one of those people who read an entire magazine while walking on the treadmill. I'd barely break a sweat, but wonder why I wasn't seeing any results. Eventually, it finally occurred to me that I wasn't working hard enough. Of course, you don't need to go all out on every treadmill workout, but you need to push yourself if you want to see improvements. Nowadays, I'm constantly changes speeds and inclines on the treadmill, so I don't even bother with a magazine anymore. My workout is more efficient, and I'm able to challenge myself and see results more quickly! 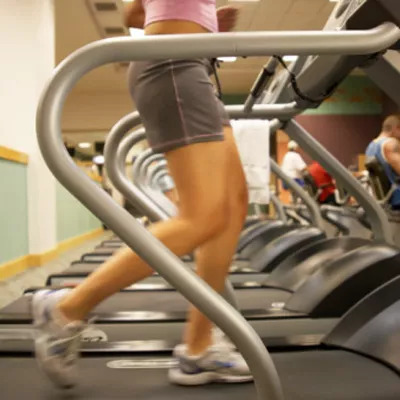 I love walking on an incline on the treadmill because it burns more calories than walking on level ground--plus, it really works my glutes-- but holding onto the siderails while I do so prevents me from getting the most out of my workout. I might feel like I am working harder and keeping up with a faster pace, but I'm actually supporting my upper body and core, so I'm ultimately making it easier for myself. Instead of making my workout easier, I slow my pace a little and pretend the rails are not even there. Sticking to one speed for your entire treadmill workout can get boring real quick. Plus, you should be warming up and cooling down at a slower pace compared to the rest of your workout. My favorite way to keep workouts exciting is by doing interval training. The interval speeds constantly change so both your mind and body will stay engaged! It might seem like no big deal when you hop off the treadmill for a quick water break, but if you don't slow down the belt, you risk the chance of injury. Ok, maybe you have great coordination, but there's always a chance you could twist your ankle or take a bad fall. Sure, it might add a few extra seconds to your workout, but it's worth your well-being to slow down the belt before you get off the treadmill.